The site of Stabiae offers an unusual opportunity to excavate one or more of the enormous villas to its fullest extent, revealing the full complex of gardens, rooms, seaside terraces and surrounding farmland. The site is largely free of modern buildings, and the Vesuvius eruption excellently preserved the villas under ash and pumice. The Superintendency of Archaeology of Pompeii and the Restoring Ancient Stabiae (RAS) Foundation are working on plans to make Stabiae an archaeological park. Pompeii and Herculaneum present life in ancient Roman towns. The villa rustica at Boscoreale is a vivid presentation of a working farm. At Stabiae the visitor would experience Roman villa culture, strolling among frescoed rooms, splashing fountains and shady gardens. Together, these three sites illustrate three major aspects of Roman culture in the region of Campania. 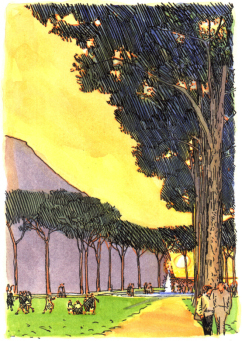 The area of the park would be ringed by a line of pines, making the site visible from Pompeii. A pedestrian path along the front of the hill will join the two principal villa sites and make the area function as an urban park even when the villas are closed. 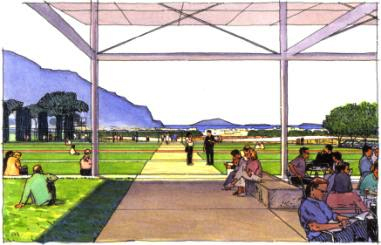 In summer, the park could host evening concerts with a cafe and restaurant. 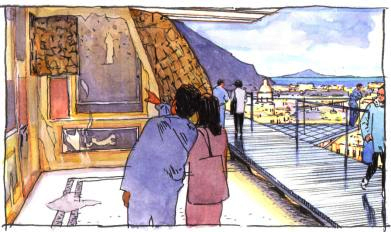 A visit to Stabiae would be very distinct from the average tourist’s visit to the large urban site of Pompeii. With perhaps only 150,000 – 200,000 visitors a year (in contrast to about 2 million for Pompeii), the park would invite a slow, thoughtful examination of life in a Roman villa and an enjoyment of the breathtaking environment of the Bay of Naples. The site would be easily accessible from the local commuter railway station (the Circumvesuviana railroad) by means of a funicular. Visitors at Pompeii could travel to Stabiae in ten minutes.